Starflight is one of those games that, once you dig in and really wrap your head around the vastness of the concept, is breathtaking. Add to the fact that Starflight really was a first of its kind - a sci-fi adventure RPG that boasts an open ended space simulator with 269 star systems and over 800 planets plus an impressive artificial intelligence system. And it all fits on a single Amiga disk. Just one. 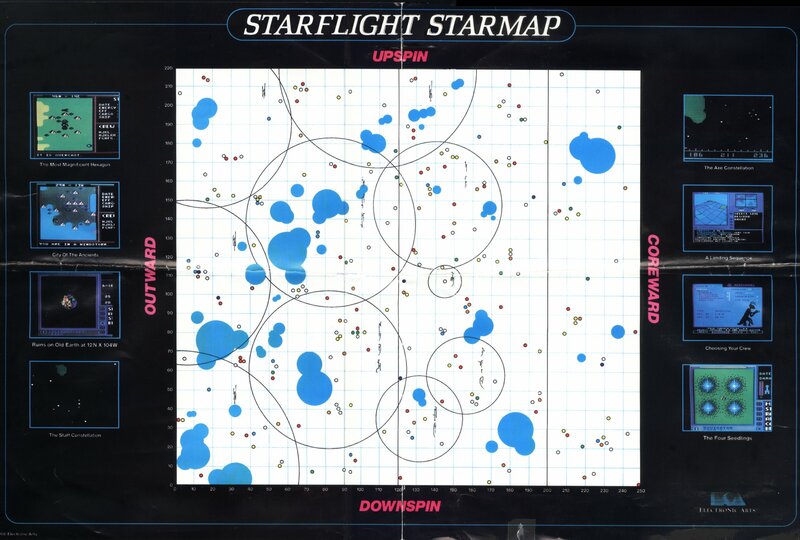 At its core, Starflight is a game that took several years to design and develop. Work began as early as 1983 and shipped in 1986 to DOS PCs - a year overdue - as the scope of the game was ambitious to say the least. It was created by a 5-man crew under the banner of “Binary Systems” and published by Electronic Arts. Indeed a VP of Electronic Arts at the time, Joe Ybarra, was so enthralled with the game’s concept that he became the producer for the game. The basic premise of Starflight sounds simple and intentionally familiar to Star Trek fans: command a space ship to “explore new worlds” and meet new alien life forms. And save the universe. Oh, and try not to get killed. First, you need to assemble your bridge crew to command the ship’s various functions. You’ll need a captain of course, a science officer, navigator, engineer, communications officer and a doctor. “Damn it, Spock!” And you have the option of choosing some various alien species but come to find out Humans, while boring, get most of the jobs done quite well. The game unfolds itself into a beautiful matryoshka doll of continuous views inward and outward. Or, as Carl Sagan put it, “The cosmos is within us. We are made of star-stuff. We are a way for the universe to know itself.” And in order to play this game, you must start to learn the galaxy like the back of your hand in order to ultimately save it from complete and utter destruction. In order to do this, you must perform tasks at the micro level (planetoid) and macro level (galaxy) as well as the meta (analysis). This constant switching of views is beautifully done and invokes interesting philosophical feelings of universes inside of universes. You’re given a star chart. Each colored dot on the map is actually the color of a star. Around each star there is the potential for solar systems to be found (sometimes the stars are all by their lonesome, sometimes several planets orbit them). And these systems need to be explored in order to find potential new homes for your species to colonize. Along the way you’re going to meet several strange space-capable alien races, each with their own peculiarities and tendencies for helping you or killing you, depending on how you decide to interact with them. Minor spoiler: you soon discover that taking an aggressive tact with aliens will make your game end quite quickly. Figuring out how to navigate most situations non-violently is generally the way to go. Starflight is not very forgiving. Communicate incorrectly during an alien exchange and you might as well be Dirk the Daring plunging to your death into a pit of lava. There are no undos. However the game does provide 5 save slots, so use them wisely and often. You’ll be backtracking quite a bit in the game as you try and sort things out. You need to also take copious notes of what you’re told by Interstellar Command (which you can only talk to when at your spaceport, unfortunately - no sub-space messages here unfortunately), and what you’re told by the alien races you encounter. At its most fundamental, this is an RPG that requires mapping and a lot of note taking. Rather than focus on never-ending dungeon corridors, though, your mind must venture to the stars of a vast star system. Just looking upon the map for the first time can be a very sobering experience. If you have the means, a paper map is by far the best way to go to navigate the expanse. But there are digital versions out there as well that can be easily used next to the game. Since in space there is no such thing as North, South, East or West the game was in a bit of a design conundrum as this is obviously a 2D game. There is no Z-axis. So, the cardinal directions have been renamed to upspin, coreward, downspin and outward. Cute concept to get around the 4 main directions you can explore and maintain the facade of deep space. In the early stages of the game your main activity is to venture out from the safety of your spaceport and mine nearby planets for minerals. Bringing these back to base you can sell them for monetary units which you use to fortify your ship with armor, shields, engines and weapons. Don’t go cheap - simply mine for a few extra hours and you should be able to max out everything and go from there. But don’t get the impression that you’ll be invincible. On the contrary, you’ll simply be “good enough” to get around from place to place. You can still be easily outgunned and swarmed upon if you act foolishly. This is a game for grown-ups, not maverick raygun-slingers. However, if you are willing to put in the time you can easily mine a TON and generate more funds than you’ll know what to do with. Especially for buying gobs of fuel so you never need to worry about running out. One of the fabulous innovations introduced in this game is the idea of “continuum fluxes” in space. For those familiar with Deep Space 9, it’s the concept of worm holes put to practical use in a game. When you find the endpoints of these fluxes - visible pockets of dancing stars - you can get pushed across vast amounts of space. This saves tons of precious fuel (endurium) as a result - realistically the most important commodity in the game. You’ll need fuel for your ship to explore the giant galaxy, and you need energy for your terrain vehicle while driving across alien planets. And so from a game mechanic standpoint, you see this repeating pattern emerge. Traverse this planet to gain resources, and traverse space to gain knowledge. Put the two together to unlock an emerging backstory. In a nutshell, there is a very powerful ancient race that is making stars go super nova, thus threatening the existence of all life. No pressure. And you realistically won’t finish this game on the first save. Or the tenth. This is an RPG from the 80s, after all. But you’ll have a freaking blast along the way. It's the Star Trek adventure RPG game we never got. But did. Starflight is, quite simply, a masterpiece. The Amiga version shines ever so brightly compared to its DOS ancestor. Coming three years after the original release, the Amiga version was given UI enhancements, mouse control and upgraded graphics. It far outshines its DOS parent. The ADF found on this page is sourced from an original disk. It should be copied and not played on directly as the game will save to the disk. Copy this ADF, then duplicate it. This way you can alway play from a fresh start. And this is the kind of game that begs to be played over and over. To that end, when you beat the game, you are allowed to continue exploring the system for...ever.